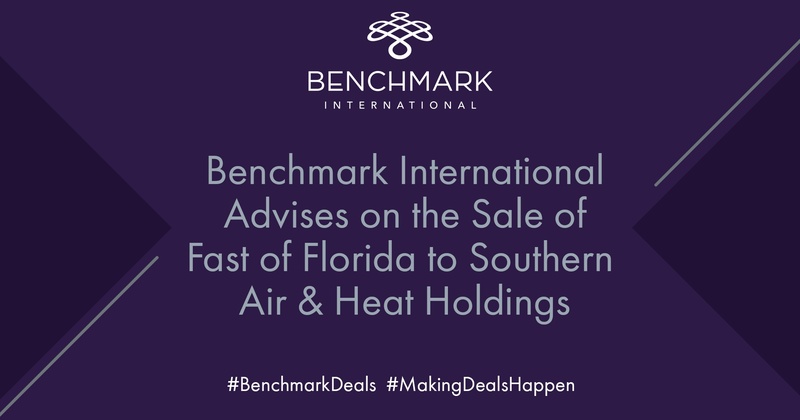 International M&A specialist, Benchmark International, has successfully negotiated the sale of its client, FAST of Florida, Inc. (“FAST”) to Southern Air & Heat (“Southern HVAC”), a portfolio company of MSouth Equity Partners, an Atlanta-based private equity firm. Based in Clearwater, Florida, FAST is a leading provider of heating, ventilation, and air conditioning (HVAC), plumbing and electrical sales, installation, and maintenance services to the residential and commercial markets. In 1972, the company was established as a small air conditioning repair shop by Eddie Vaughan. Eddie’s wife, Melissa, joined the company in the early 1980’s, assisting with administrative duties and bookkeeping. As the company grew, FAST evolved to expand its service offerings in order to remain competitive and add additional revenue streams. In 2005, Mr. Vaughan passed away after a long illness, and Melissa assumed ownership of the business. Under Mrs. Vaughan’s leadership, FAST has continued to experience tremendous growth while continuing to offer the same level of quality service the company was built upon. Today, the company employs nearly 50 people serving Pinellas County, Florida and the surrounding markets.